I’ve just been skimming through an interesting report about the strength of UK physics research. 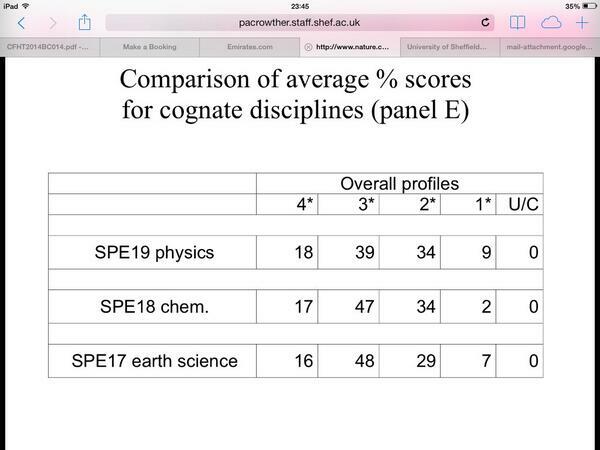 One of the conclusions of said document is that UK physics research is the best in the world in terms of quality. I couldn’t resist a brief post to point this out to any members of the Physics panel involved in the 2014 Research Excellence Framework. 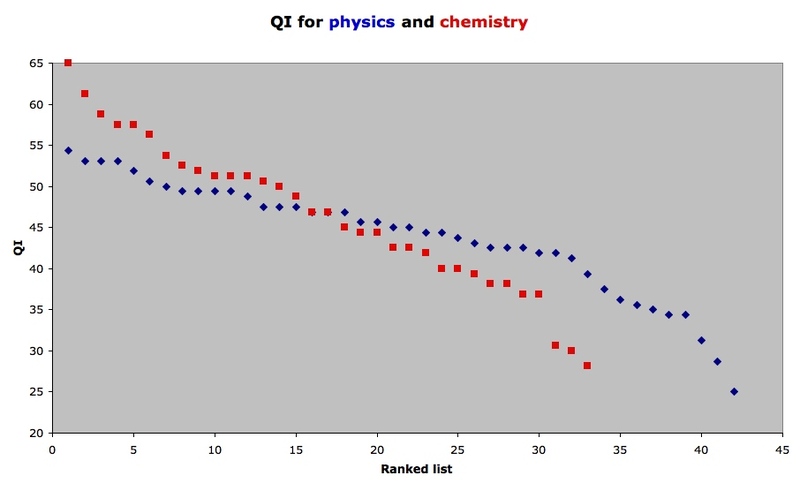 My motivation for doing this is that the Physics panel of the 2008 Research Assessment Exercise evidently came to the conclusion that UK physics research wasn’t very good at all, awarding a very much lower fraction of 4* (world-leading) grades than many other disciplines, including chemistry. I’ve never understood why the Panel arrived at such a low opinion of its own discipline, but there you go.. The news today is full of speculation about the nature and extent of impending public spending cuts expected to be announced in the Queen’s Speech next Tuesday. Among the more specific figures being bandied about is a £700 million cut to the budget Department of Business, Innovation and Skills (BIS) which encompasses both scientific research and the university sector. It’s impossibly to say precisely where the axe will fall, but it’s very likely that university-based science groups in England will face a double-whammy, losing income both from HEFCE and from the Research Councils. The prospect looks particular dire for Physics & Astronomy, which rely for their research grants on the Science and Technology Facilities Council (STFC) which savagely cut back science research even before the credit crunch arrived. If STFC gets cut any further then the result will be even worse carnage un universities than we’ve experienced over the last year or two, especially since it looks like there will be no changes in its Executive. Here in Wales the situation is even more complicated, as is explained in a long article in this week’s Times Higher. Cuts to the Research Councils will, of course, affect university research groups in the Principality as their remit covers the whole of the United Kingdom. However, responsibility for Higher Education in Wales is devolved to the Welsh Assembly Government. This means that any cuts to the University budget announced next week will not apply here (nor indeed in Scotland or Northern Ireland). 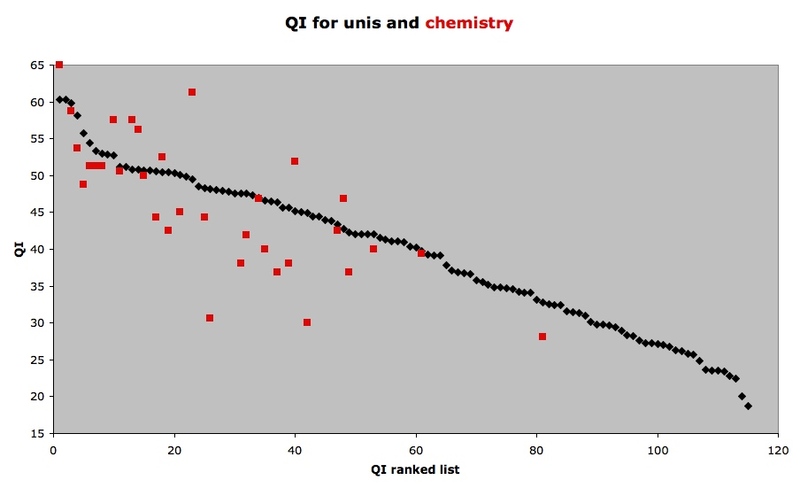 However, as I’ve blogged about before, it’s not obvious that this is good news for fundamental science in Wales. The Welsh Assembly Government’s blueprint for the shape of Higher Education in Wales, For Our Future, signals what could be dramatic changes in the way university funding is allocated here. There’s a lot of nervousness about how things will pan out. Currently, most university funding in Wales comes through HEFCW in the form of recurrent grants. However the WAG has recently set up a Strategic Implementation Fund which in future supply 80% of all university funding. The new(ish) Minister responsible for Higher Education, Leighton Andrews (who will be giving a public lecture in Cardiff about the changes next week) seems to be determined to take control of the sector. It’s good to have a Minister who shows some interest in Higher Education, but I’m wary of politicians with Big Ideas. We’ll have to wait and see what happens over the next year or so, but I think there’s an opportunity for Wales to do something truly radical and break away from systems that simply copy those in place in England with a much lower level of resource. Given that HEFCW has already been told how 80% of its funding should be administered, why bother with HEFCW at all? Scrapping this quango will remove a buffer between the universities and the WAG, which might be a dangerous thing to do, but will also save money that could be spent on higher education rather than bureaucracy. And while we’re at it, why doesn’t the WAG take Welsh universities out of the Research Excellence Framework? In the new era why should Welsh universities be judged according to English priorities? On the teaching side, the WAG wants to see more flexible study options, more part-time degrees (including PhDs), more lifelong learning, and so on. I think that’s a reasonable thing to aim for given the particular socio-economic circumstances that pertain in Wales, but I can’t really see scope for significant numbers of part-time degrees in physics, especially at the doctoral level. A crucial issue that has to be addressed is the proliferation of small universities in Wales. England has a population of 49.1 million, and has 91 universities (a number that many consider to be way too high in any case). The population of Wales is just 2.98 million but has 12 universities which is about twice as many per capita as in England. I for one think this situation is unsustainable, but I’m not sure to what extent mergers would be politically acceptable. The WAG also wants to focus funding on “priority areas” that it perceives to be important to future development of industry in Wales, including health and biosciences, the digital economy, low-carbon technologies, and advanced engineering and manufacturing. Fair enough, I say, as long as “focus on” doesn’t mean “scrap everything else but”. The big worry for me is that research doesn’t feature very strongly at all in the WAG’s document, and it isn’t in good shape in any case. According to the last Research Assessment Exercise (RAE), only around 14% of Welsh research is of world-leading quality and most of that (90%) is concentrated in just four institutions (Aberystwyth, Bangor, Cardiff and Swansea). 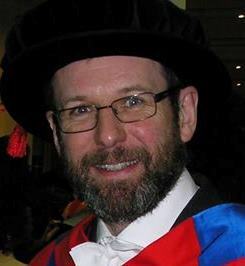 Physics in Wales did particularly poorly in the RAE and in any case only involves three universities, Bangor having closed its Physics department many years ago. Indeed the RAE panel went out of its way to make unfavourable comments about the lack of coordination in Welsh physics – comments, I might add, that went entirely beyond the panel’s remit and should have attracted censure. Physics is also an expensive subject so if we are to do better in future we need additional investment. Cardiff University is doing its best bring this about, but I think we should explore closer ties with Swansea and explicit encouragement from the WAG. Julie Lydon, vice-chancellor of the University of Glamorgan and the first female head of a university in Wales, says expertise in STEM will have to be developed in “distinct areas”. Given its small size, Wales must be careful to set itself realistic aims, she says. The country faces a complex challenge, Lydon adds. “We don’t have anywhere near the range and extent of research (that we should) for our size. We’ve got to move it up a gear, and we’ve got to raise aspirations. We’ll do that in niche areas, and we’ll do that by partnership, not on our own. A focus on STEM would neglect some areas in which Wales is strong, Lydon says. Thanks to investment from major employers such the BBC, disciplines such as media are growth areas and critical to the economy, but they are not strictly defined as STEM subjects. No, media studies isn’t a STEM subject. Nor do I think Wales can continue to rely on its economy being propped up by public bodies such as the BBC. The expected round of wider public spending cuts I mentioned at the start of this piece will effectively scupper that argument and I’m sure privatisation of the BBC is on the new government’s agenda anyway. The future requires more ambition than this kind of thinking exemplifies. Sadly, however, ambition doesn’t seem to be something that the Welsh are particularly good at. Dylan Thomas’s phrase “The Graveyard of Ambition” was specifically aimed at his home town of Swansea, but it does sum up an attitude you can find throughout the country: a resolute determination to be mediocre. Wales is indeed a small country. So is Scotland (population about 5 million), but the Scots have for a long time placed a much higher premium on science and university education generally than the Welsh (and even the English) and they have a thriving university sector that’s the envy of other nations (including England). I think it’s time for a change of mentality. Now that it is no longer the season to be jolly, I’ve decided to return to the theme of doom and gloom that prevailed before Christmas. In particular, you may recall that just before Christmas, Lord Mandelson wrote to the Higher Education Funding Council for England (HEFCE) to announce a package of £135 million cuts for next year. It has now been confirmed – see the story in the Times Higher – that these cuts are on top of huge cuts arising from decisions announced in the pre-budget statement, earlier in December. Altogether these cuts will amount to over £900 million being taken from the Higher Education budget over the next three years, or about 12.5% of the total. The reduction in budget amounts to a cut in the “unit of resource” paid by the government directly to universities, and with a review of tuition fees currently being carried out by Lord Browne, the likelihood is that students will have to pay much more in future to make up the difference if the sector is to survive at its current level. This would require lifting the cap on tuition fees, a decision on which will almost certainly be postponed until after the next General Election (due by summer 2010). The combination of immediate cash cuts and uncertainty about the future will cause widespread unease and apprehension throughout the university system, and I think it won’t be long before we start hearing of more closures. We won’t know what the situation will be in Wales until the Welsh Assembly announces its allocations to HEFCW, the Welsh counterpart of HEFCE. I can’t say I’m optimistic, especially after reading their recent discussion document on the future of higher education in Wales. Things might work out rather better in Scotland, where the university sector seems to be valued more highly than elsewhere in the United Kingdom. Physics will be hit particularly hard by these cuts. It’s an expensive subject to run, and attracts only modest numbers of students paying customers. Savage cuts in research grants and postgraduate funding from STFC will have sent a clear message to university administrators that this is a risky subject to be investing in, a point of view likely to be reinforced by the inexplicably poor showing of physics in the 2008 Research Assessment Exercise. 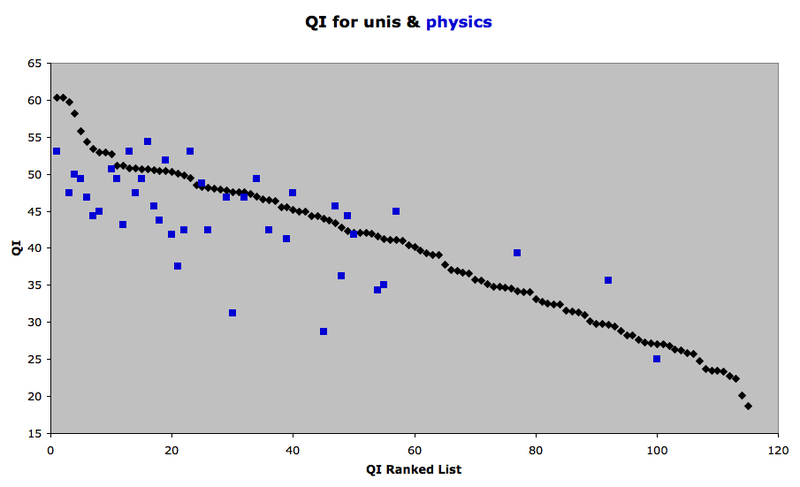 The outlook for physics and astronomy looks even bleaker than for the rest of the university system, at least in England and Wales. But my fears for the New Year are even wider than that. The deep cuts that have been imposed on Higher Education will save less than £1billion over the next three years. Compare that with the estimated budget deficit for 2009/10 of £178 billion and you’ll realise that it’s a drop in the ocean. The problem is that there’s an election coming up and the government is scared of trying to tackle the problem because of fears it will alienate voters. It has ring-fenced expenditure on politically sensitive things like schools and hospitals so the only things that it can cut are things that potential labour voters don’t care so much about, such as universities. And of course it realises that doing the sensible thing and putting up income tax would be electoral suicide, although it is absolutely certain that whoever wins the next election will have to do it. The biggest danger with the strategy of waiting until after the election before deciding to start tackling the debt crisis properly is that before long the international markets are going to realise that Britain is basically insolvent. It is true that the stock market has recovered from its low point in March 2009, but only slowly and uneasily. The government seems to be assuming that the markets will politely wait until Britain has gone to the polls before passing judgement on the longer term futue. However, if sovereign debt rather than private debt becomes a major concern, I don’t think the UK economy will survive until the election without at least one major market correction, and off we’ll be into another, probably deeper, recession. It might not be the UK that sparks this off, but the levels of sovereign debt in Central and Eastern Europe could trigger a market panic that engulfs Britain too. The prospect of a hung parliament could easily give investors the jitters too. There have been considerable increases in the level of government investment in UK universities over the last decade. Admittedly, not all of it has been useful – much has been wasted in extra bureaucracy, pointless initiatives and ever-growing Human Resources departments – but at least years of neglect were being reversed. Now the next few years offer the prospect of all the increases in funding being reversed. Higher education was one of the last sectors to benefit from extra government spending, and it is the first to have it taken away again. After spending the best part of the last couple of days being prodded and poked and subjected to all manner of indignity in the name of medical science, I think it’s appropriate to return to the blogosphere with another rant. Before I start, however, I’d seriously like to thank everyone at the University Hospital of Wales at Heath Park for making my visit there as brief and painless as possible. Everyone was very kind and very efficient. I’m not going to blog about the details, as Columbo doesn’t like reading about other peoples’ ailments. Apparently, however, they don’t really know how to do this so they have set up a number of pilot studies to try to find out. I’d feel a little more comfortable if the bureaucrats had thought about what they were going to do before announcing that our future research funds were going to depend on it. Meanwhile, applicants for grants from any of the research councils must include a statement of the “economic or social” impact their research will have. Understandably, those of us working in “blue skies” research are very nervous about this new regime. There is more than a suspicion that the new emphasis on impact is intended to divert funds away from “pure” curiosity driven research and into areas where it can have an immediately identifiable short-term economic benefit. This has led to a petition, with over 13000 signatures, by the University and College Union calling for the impact statements to be abandoned. I don’t know who is going to assess these impact statements, but unless they have a flawless ability to predict future technology I don’t think fundamental physics is going to score very well at all. To see my point, consider the case of J. J. Thomson, who is generally credited with having discovered the electron and who was awarded the Nobel Prize for Physics in 1906. Thomson made extensive use of cathode ray tubes in his studies; these later found their way into sitting rooms across the world as essential components of the classic television set. But that took decades. I doubt if an impact panel looking at Thomson’s work – even if they were physicists rather than grey-suited bureaucrats – would have found any of it likely to lead to immediate economic benefit. The point is that when he discovered the electron it wasn’t because he was actually trying to invent the television set. Recently I have read that some believe it is impossible to predict the economic impact of blue-skies research. To be clear, we are not asking for accurate predictions – simply a consideration of potential. Basic research underpins all disciplines and builds pathways to new technologies with economic and social applications. It may build on an existing body of knowledge, connect to other research around the world or attract new industries to the UK. There are many routes to impact. I believe that I could write a statement indicating potential impact for any proposal I have seen, and to hear that bright academics say they can’t do it sounds a little disingenuous. Hello. Looks like you’re writing an Impact Assessment. Would you like me to pad it out with meaningless but impressive-looking socio-economic buzzwords for you? If it’s just another exercise in vacuous bureaucracy then it’s bad enough, but if it is the other possibility then of course it’s even worse. It could be the end for disciplines like astronomy and particle physics as well as the end of Britain’s history of excellence in those areas. I’ve already blogged about my view of short-termism in research funding. Essentially, my point is that government money should be used to fund precisely those things that don’t have immediate economic benefit. Those that do should be funded by the beneficiaries, i.e. commercial companies. Politicians probably think that all this complaining about impact means that scientists are arrogantly assuming that the taxpayer should fund them regardless of the cost or the benefit. I can only speak for myself, but I think that’s very unfair. I’m very conscious that my research is funded by Joe Public; that’s one of the reasons I think I should spend time giving public talks and doing other outreach activities. But I think the public funds me and others like me to do “useless” things because, in the end, useless things are more important than money. The government is probably right to say that the UK economy doesn’t benefit as much from our scientific expertise as is the case with other countries. The reason for that, however, lies not with our universities and research laboratories but with our private industrial and commercial sectors which are, for the most part, managed with a very low level of competence. British universities are demonstrably excellent; our industry is demonstrably feeble. The persistent failure of the private sector to invest in research and development shows that it is in drastic need of a good shake up. British companies, not the taxpayer, should be paying for research that leads to profit for them and for that to happen they will have to learn to engage better with the University sector rather than expecting inventions to be served up on a plate funded by the taxpayer. Universities and research labs should continue do what they’re good at, maintaining a culture within which curiosity and learning are promoted for their own sake not just as part of the dreary materialistic cycle of production and consumption that is all we seem to be able to think about these days. So at the end I’ve come to the conclusion that, perhaps, insofar as it can be demonstrated, economic impact should be included in the forthcoming Research Excellence Framework. Research which leads directly to the economic gain of the private sector is precisely the type of research that the taxpayer should not be paying for. If it can be proven that a given department has engaged in such activity, its state funding should therefore be cut and it should be told to recover the funds it has misused from the company that has benefitted from it. Economic impact should be included with a negative weight. And if you think that’s a silly point of view, consider what happens with the other major part of a university’s activity, teaching. Students, we are told, are the primary beneficiaries of their education so they should have to pay fees. In the current regime, however, they only do so when their earnings reach a certain level. If commercial companies are to be the primary beneficiaries of state-funded research, why should they not likewise be asked to pay for it?